If you missed all the hype, DiCaprio won his first Oscar for this role, so it’s safe to say he does an excellent job, especially because he spends much of The Revenant nonverbal. Based on the 2002 novel by Michael Punke, The Revenant is aptly named. Defined as "a person who has returned, especially supposedly from the dead", the film explores the life and (almost) death of trapper Hugh Glass (Leonardo DiCaprio; Titanic). While loosely based on Glass's life, the book and movie fantasize his story and add elements to make it more appealing to audiences. Originally from Pennsylvania, and a sea captain by trade, Glass found himself in danger when he fled from pirates into hostile Indian Territory. He then became a trapper and narrowly escaped several Indian attacks. When he ventured off on his own one day, he found himself on the wrong end of a bear and suffered multiple, life-threatening wounds. When two members of his team volunteered to stay behind until he dies, they discover he was hanging on to life. They decided to take his weapons and left him under a bush. Miraculously, Glass survived and hunted down the two men to get his beloved gun back. That is, supposedly, the real story. Taking poetic license, the movie added his half Pawnee son who was killed by one of the other trappers and Glass's quest became one to avenge his son's murder instead of getting back his firearm. If you missed all the hype, DiCaprio won his first Oscar for this role, so it's safe to say he does an excellent job, especially because he spends much of the movie nonverbal. Relying on body language and facial expressions to get his feeling and thoughts across, DiCaprio proves why he is such a consummate actor worthy of praise. It also helps that the buzz behind this film discusses how he really did many of the things seen on the film, such as eating real, raw animal liver and crawling into a horse carcass. The rest of the cast does a good job, including an almost unrecognizable Tom Hardy (Legend) and several Native American actors making their film debuts. Besides DiCaprio, the other star of this film is the scenery. The beautiful Canadian and Argentinian settings are breath taking and fully help to set the scenes and the mood of The Revenant. Cinematography wise, this film is top notch and spectacular. From the lush greens of the forest to the fast-flowing, icy waters of the river and the barren fields of the plains, the movie explores sights that are still somewhat pristine and untouched by man. Not only are the visuals beautiful to view, but also they come across with such clarity helped by the 1080p high definition video of the Blu-ray. The crispness enhances the viewer's experience as one can really feel as though they are surrounded by the chilly air of the northwestern United States forest. Equally as sharp is the DTS-HD Master Audio 7.1. The surround sound fully immerses the audience in the world of early 1800's trappers and indigenous people. There are only two extras on this Blu-ray. One is a gallery of haunting pictures taking and various stages of filming and the other is a 45-minute documentary entitled A World Unseen that explores the making of the film, the characters, the Native Americans and the ever-present struggle of climate change. While this feature was released earlier this year on You Tube, it is more magnificent to watch on Blu-ray quality. While one can appreciate the fine acting skills of the performers and the sacrifices they made for their craft, along with the stunning visuals, the film can be a little slow and tedious. Director Alejandro González Iñárritu (Birdman) would have been wise to edit out some of the unnecessary moments. Worth watching because of DiCaprio and the background, Audiences could do worse when selecting their Saturday night, stay home feature. 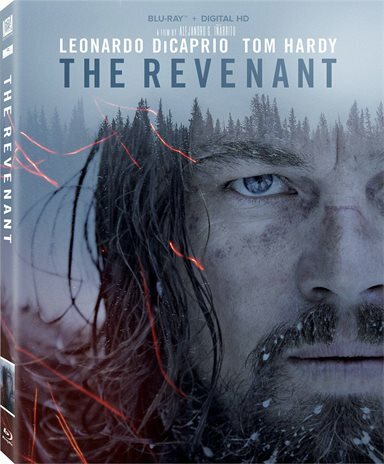 Download The Revenant from the iTunes Store in Digial HD. For more information about The Revenant visit the FlickDirect Movie Database.